Eva Underground by Dandi Daley Mackall takes us back to Communist Poland. Our main character, Eva, and her father travel there from Chicago because Eva’s father wants to help the radical underground movement. Eva is angry and afraid – she has no desire to be a part of the group or be anywhere but home with her friends in Chicago. Slowly but surely, she becomes immersed in her surroundings and begins to understand the importance of what her father and his friends are trying to accomplish. She also quickly becomes interested in Tomek, the 19 year old translator. I really felt like I got an inside view into a piece of history I had little to no prior knowledge of. 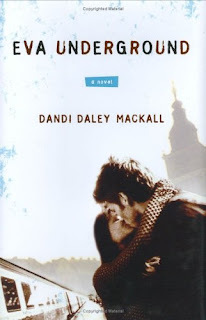 I was impressed with the way Dandi was able to both keep things basic enough to be easily understood and intense enough to feel harsh and realistic. It doesn’t take long for Eva to begin to face the harsh realities of life head on. As she becomes more interested in the people around her, she is introduced to her own shortcomings (namely, being a spoiled American) and ends up trying to grow into a person she can look in the mirror and be proud of. One of my favorite parts of the book is when she travels with Tomek to his family’s plum orchard. She initially goes only to try and get in with Tomek, but once she is there – she falls in love, not only with him, but with his family and community. She discovers the beauty of people – even when under intense pressure from the government and from the simple fact of being poor – she sees people refuse to compromise integrity, honesty and basic human decency. This is not one of the books that is written in such a way that the reader becomes a part of the story. I always felt very much like an onlooker versus a participant. So, while I don’t feel that the writing itself is extraordinary on its own, I do believe that the story it told is. There is a lot of intensity and tension packed into a fairly short book; I definitely recommend taking the time to read it! My Husband was born and raised during the time of it in Poland, that is he was there for the last of it. I loved reading books that give me a glimpse of what it was like. Nice review and good info in the last paragraph. Sounds interesting and I wish there was a good way to let a lot of current American young people have similar revelations about life. Great review! I never would have thought to pick up this book but your review makes it very interesting to read. I like that we get to watch as she realizes some of her shortcomings and seeks to improve herself and grow, I always enjoy stories with protagonists like that:) Wonderful review Allison, I hadn't heard of this one before! This sounds really interesting!! It's not something I normally would pick up, but you make it sound really good!